Volvo says it's showing a special-edition Volvo C30 in Frankfurt that offers a few energy-efficiency tweaks, giving it an estimated 52 miles per gallon. It's powered by a 1.6-liter turbodiesel and fitted with a new autobox that reduces torque loss during upshifts, which Volvo says boosts efficiency by eight percent. It's called Powershift, and it's the equivalent of two manual gearboxes controlled by separate clutches. Along with VW's BlueMotion and Mercedes's Bluetec, the model furthers the idea that this year's Frankfurt show will be all about the cleaner diesels. Hybrid who? In parallel with Volvo Cars' focus on biofuels and hybrid technology, energy-effiency improvements are continuously being made to the company's conventional drivelines. Volvo Cars' experts have succeeded in reducing fuel consumption by more than 0.4 l/100 km from 4.9 l/100 km which is the official figure for the C30 1.6D that is available on the market today. Translated into CO2 emissions, this is a reduction from 129 g/km to below 120 g.
* Aerodynamics. The Efficiency has reduced chassis height, a new rear roof spoiler, a new rear bumper, underbody panels, optimised engine cooling and aerodynamically optimised 16-inch wheel rims. * Powertrain efficiency increase. This includes new low-friction transmission oil, optimisation of steering servo assistance and engine management optimisation. Powershift cuts fuel consumption by about 8 percent compared with today's automatic transmissions. 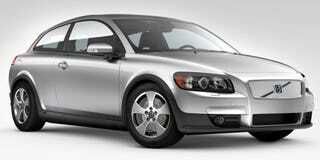 It will be available in the Volvo C30, S40 and V50 with the 2-litre turbodiesel (2.0D) engine. The environment is in constant focus as Volvo Cars initiates continuous improvements in its other petrol and diesel engines. For petrol engines, the company's experts are examining how direct-injection technology can be further refined and they are also looking at even more advanced control of both the air/fuel mixture and valve control. "When it comes to diesel engines, it isn't fuel consumption that is the greatest challenge. Here the main challenge is to meet the increasingly tough demands on regulated emissions such as nitrogen oxides and particulates without jeopardising the diesel engine's already low fuel consumption," says Magnus Jonsson.